Massage therapy. Beautiful woman in a spa with massage therapy. Beauty treatment concept. 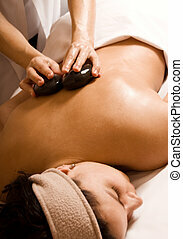 Woman relaxing getting spa hot stone therapy back massage procedure in salon. Body care healthy lifestyle.